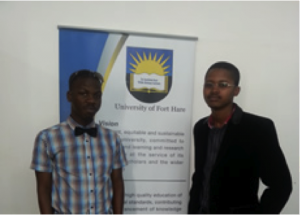 Two students from the Department of Applied Maths and Physics, Mhlasakhululeka Mvubu and Mxolisi Bhengu were selected from a pool of applicants to attend a two week program; the National Astrophysics and Space Science Program (NASSP) hosted by the University of Cape Town. The purpose of the program was to introduce students with a high aptitude for Maths and Physics, who have had no prior exposure to Astrophysics and Space science to possible career paths in the discipline. Through various projects and presentations, including a tour of the Southern African Large Telescope, the program served as an introduction to the Honours in Astrophysics and Space Science program at the UCT, to which the students were availed detailed information. Bhengu was pleased to have been introduced to Astronomy through the program and is intent on furthering his interest in the field, adding that the study of Astronomy, which reveals new patterns of life will enlighten him to the world within and around us. The two students’ academic records are exceptional, with Mvubu having received 22 distinctions over a three year study period while also holding the of the coveted Square Kilometre Array (SKA) bursary. The students partly credit their selection to the program on the commitment they have displayed in their studies which they find both challenging and fulfilling.